But I can see how this is changing as more town centres improve their Leisure offer, and as those brands with a strong presence on social media (which seemingly have more of an urban bias) influence more of our decision-making during key events. 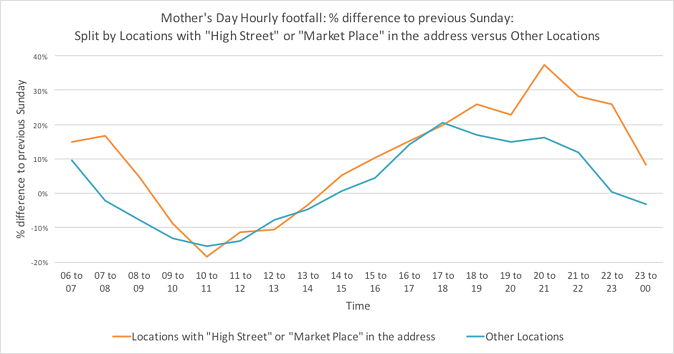 Evidence from LDC’s ‘smartstreetsensor’ footfall partnership devices shows that there was a 1% increase in footfall in our towns and cities on Mother’s Day compared to the previous Sunday. This is more than I expected, but still nothing to write home to Mum about. However, locations with ‘High Street’ or ‘Market Place’ in the address saw a much higher increase – on average of +5%. The high streets with the highest gains tended to be in medium-sized towns with a good mix of retail and leisure occupiers – perhaps these areas have a stronger sense of community that Mum would appreciate? Digging a little deeper, it becomes clear that locations with heritage or rich history and clusters of restaurants, theatres or other cultural interest saw the highest gains in footfall – for example parts of Kingston Upon Thames, Leamington Spa, Chester, Cambridge and York. The Mother’s Day data suggests that this was less about a Sunday lunch treat for Mum, and more about a wider evening experience, with the highest gains in footfall on these high streets actually seen during the evening (6pm-11pm). This has some similarities with the patterns we saw on Valentine’s Day, when the highest footfall gains were in the evening. However, this was concentrated around clusters of restaurants with cinemas in larger city centres, indicating that a different type of Leisure experience was being sought to that on Mother’s Day. The relatively small uplift in the early afternoon of March 26th suggests that some of these High Streets are either already at capacity for Sunday lunch, or perceived as too busy / inappropriate for treating Mum, and that an evening out with a mixture of food and entertainment is a better option. A good example of this is High Street, Oxford which has a number of family-friendly restaurants and is located within a short walk of the main shops and several theatres, with good transport links. With relatively few vacant premises on the street (and no vacant restaurants), this seems to be a safe bet for an evening out with Mum. With an extra 200 people per hour from midday onwards, Oxford High Street seems to be well positioned to make the most of annual family events, with niche occupiers such as Formosan Tea Bar apparently able to tap into the potential to drive quality footfall without being particularly active on social media (like several other occupiers on the street). Oxford, of course is a unique case, with a high student and worker population, coupled with affluent local demographics and additional demand from tourism. Footfall densities in parts of the city centre are some of the highest in the country as a result. Elsewhere, marketing and social media engagement needs to work harder to drive visitor numbers. 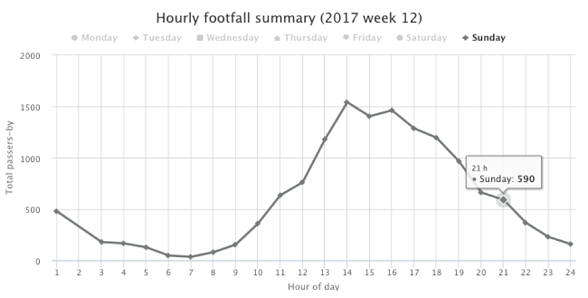 By linking footfall data to social media indicators from our partners at Maybe*, LDC is starting to investigate the wider picture for key events and trends on GB high streets. Eastgate Street in Gloucester is a good example of a high street that performed well on Mother’s Day, and just happens to have a group of independent occupiers with a strong social media presence. This Street is second only to College Street for it’s relative volume of social media posts and friends (per independent occupier), and showed a minimum 26% footfall increase on Mother’s Day compared to the previous week (based on 3 sensors along the street). 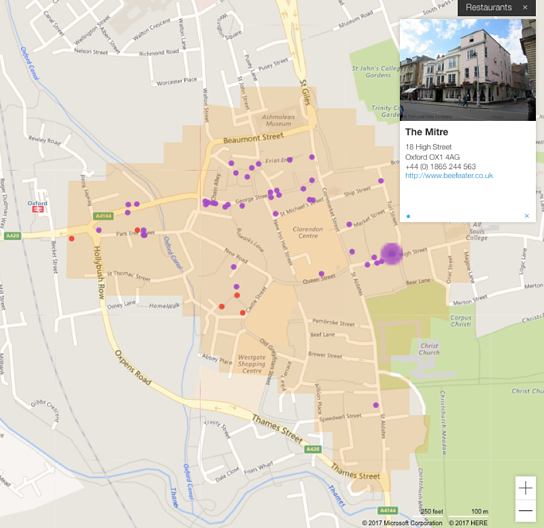 We’ll shortly have footfall data available for College Street and other key locations in Gloucester City Centre via our exciting new partnership with Marketing Gloucester to install the highest density of footfall sensors for any city in the UK. This will generate data that will help retailers and place management teams intelligently model the city. Jason Smith, Chief Executive of Marketing Gloucester says "We are fully convinced that the high quality and locality specific data being produced through adoption of next generation technology will prove to be revolutionary by providing information helping to inform decisions that will shape the future high street. Already we are beginning to extract detailed data that potentially will have a significant impact on how we advise retailers, plan events, plan regeneration and use resources." Based on its combination of heritage and Leisure occupiers, I’d expect footfall on College Street to show a high increase when we review the Mother’s Day data next year. 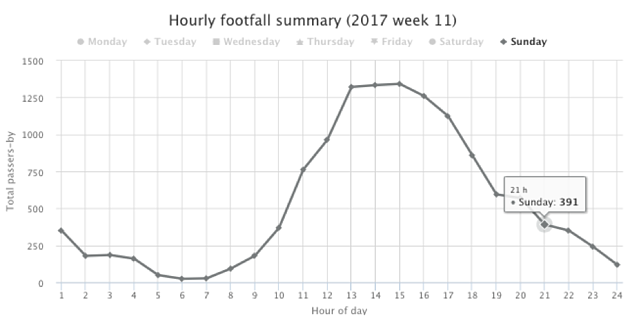 By this time we should also know much more about the links between social media, footfall during key seasonal events and other indicators of retail health. 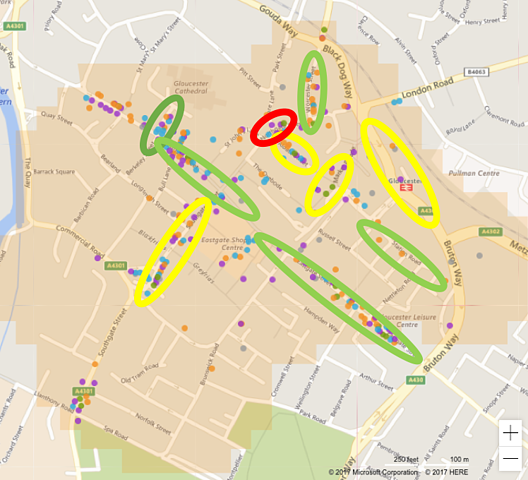 Ovals legend: Green = High, Red = Low || Dots legend: Purple = Leisure units, Blue = Comparison (i.e Fashion, Florists, Jewellers,...), Green = Convenience, Orange = Service (i.e Banks, Hairdressing,...), Red = Vacant units. Within the project, we’ll aim to understand whether the relatively low level of social media engagement on Northgate Street is a genuine problem, and how this relates to footfall over a longer time period. We’ll also explore the inter-relationship and halo effects of areas with high levels of online engagement, and measure how this influences physical levels of footfall in different types of place. As Polly Barnfield says “It's still early days linking this data, but what is very clear is there is a trend of good footfall and a high Social Media Index, that does not surprise me - but it is the business proof that many need to see. Digital investment in creating influence should be seen as a key part of the infrastructure of place in the same way that roads and signposts are. What you see on your mobile phone is what increasingly drives footfall to place." Digital investment in creating influence should be seen as a key part of the infrastructure of place in the same way that roads and signposts are. What you see on your mobile phone is what increasingly drives footfall to place. By this time next year, I have a feeling that I will be reporting on a very different Mother’s Day experience where my online decisions in advance of the day are more influenced by our increasingly smart cities. Any high streets between Nottingham and Cheshire that can offer a country pub experience with flowers delivered to the table and a dose of family-friendly culture can contact me. You’ll help to make a very deserving Mum very happy.